Sent off with a 21-gun salute, the body of George H.W. 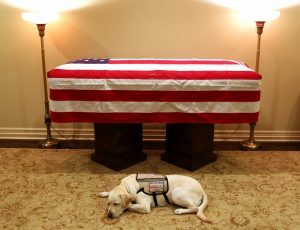 Bush left his beloved Texas for the final time Monday, headed to Washington as the nation paid tribute to the 41st president for a lifetime of public service that began in the Navy during World War II, ended with four years as president and was characterized throughout by what admirers say was decency, generosity and kindness. 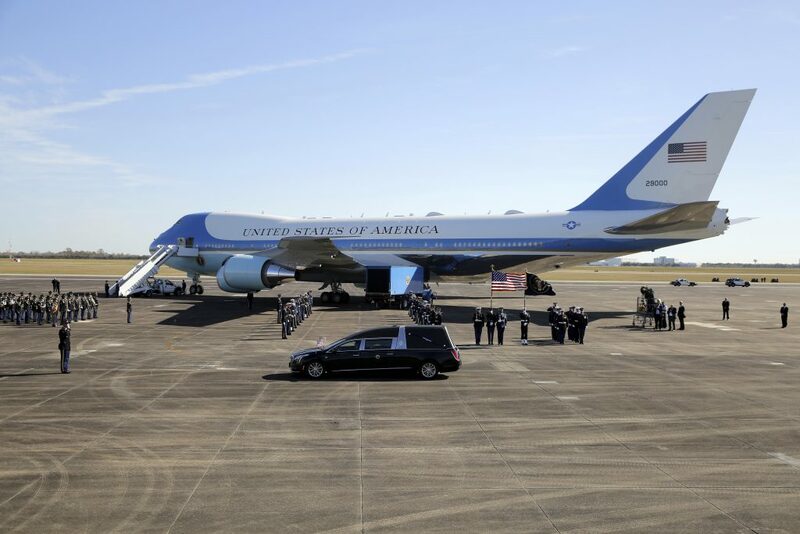 A long motorcade accompanied the hearse carrying Bush’s remains from a Houston funeral home to nearby Ellington Field for the trip to the nation’s capital on an aircraft that serves as Air Force One. Military artillery fired the salute, and servicemen carried the casket to the plane. A similar outpouring is anticipated in Washington this week during the state funeral for Bush, who died late Friday at his home in Houston, at the age of was 94. Afterward, Bush will be returned to Houston to lie in repose at a church before burial Thursday at his family plot on the library grounds. His final resting place will be alongside Barbara Bush, his wife of 73 years, who died in April, and Robin Bush, the daughter they lost to leukemia in 1953 at age 3. Bush’s casket was to arrive in Washington on Monday afternoon aboard the U.S. military airplane. The crew was tasked by President Trump with carrying out “Special Air Mission 41,” a reference to Bush’s place in the roster of America’s presidents. “He was a patriot. He demonstrated that in war, he demonstrated that in peace. He was able to demonstrate that in his four years of service,” Powell said on ABC. President Trump has ordered the federal government closed Wednesday for a national day of mourning. Flags on public buildings are flying at half-staff for 30 days out of respect for former President Bush.